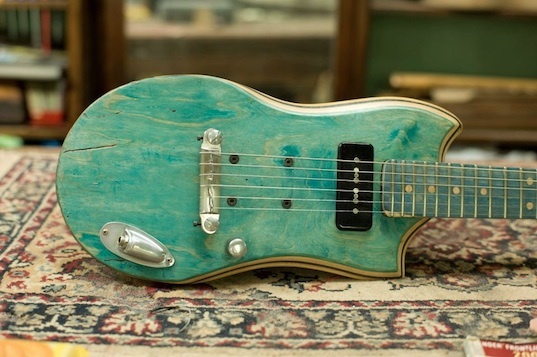 Combining their respective expertise in things that rock and things that roll, Argentine luthier Ezequiel Galasso and professional skateboarder Gianfranco de Gennaro Gilmour hatched an idea to breathe new life into retired skateboard decks by­­ transforming them into one­-of-­a-­kind electric guitars. Thus, Skate Guitar was born, offering bygone boards a chance to shred as hard in a second form as they had in their first. Each Skate Guitar is composed of the reclaimed wood from two old skateboard decks, one for the body and the other for the neck. Rugged as they may be, these artful instruments aren’t designed to hide their origins as skateboards. In fact, the scuffs and dings from their days of at the skate park only adds to their aesthetic. Such creative repurposing not only keeps well­worn decks from the skateboard graveyard, but its added value promises to make Skate Guitars a lucrative business venture as well. Galasso and Gilmour say they have already received hundreds of inquiries about their instruments, which run $1000. A small price to pay, perhaps, for the chance to kickflip down the the “Stairway to Heaven” or grind the rails of the “Crazy Train”.